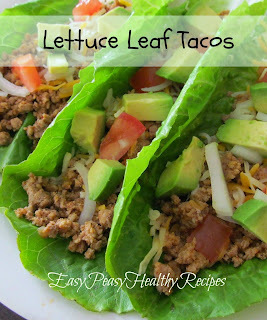 For those on a low-carb kick that love Mexican but want to avoid all the carbs in taco shells, try this alternative for taco night. It uses lettuce leaves instead of taco shells to make a dish that's halfway between a lettuce wrap and a taco. Low on carbs and still delicious! To make them ever healthier click here for an easy recipe for Homemade Taco Seasoning. Helpful tip: Using a pastry blender is a great way to break up ground meat into tiny fine pieces. I discovered this tip years ago and it works great especially in a recipe like this where you want the meat to be crumbly. Cook ground turkey in olive oil with onion and bell pepper. Break up ground turkey into little pieces with a spatula or a pastry blender. Add taco seasoning and simmer until meat is cooked thoroughly.